A beautiful villa that sleeps ten plus, and is right in the heart of Seminyak? Sign us up! Villa Shambala will definitely be a popular choice amongst the cognoscenti with large families or groups of party people who simply dig the happening atmosphere of Seminyak. The design, with two bedrooms and a TV room in the main building and three bedrooms and another TV room in the guest house, is a great layout for bringing the in-laws or giving the teenagers (and yourselves) some space. The staff are friendly and very efficient, and the cook can turn his hand to anything. Make sure you grab yourself a massage or an Ayurvedic treatment in the specially-built spa room adjacent to the pool. The owner is an artist and jewellery designer; some of her unique creations can be seen in the villa and are available for guests to purchase. Returning to Villa Shambala in August 2014 we were happy to see that the same high standards are not only being maintained, but have been enhanced by two smart new facilities; a sun deck with a beautiful backdrop, and an outdoor-but-undercover dining area with built-in barbeque which has been installed next to the living room. Not many five-bedroom villas come this close to the action, with stacks of shops, restaurants and the beach a mere five-minute-walk away. We loved the design, the antique doors, the ornately-carved joglo canopy over the bed in the master bedroom, and the accessories such as the brass hands and elephant-head towel hooks in two of the bathrooms. We had only nice surprises. There’s no noise, no cars, no problem. 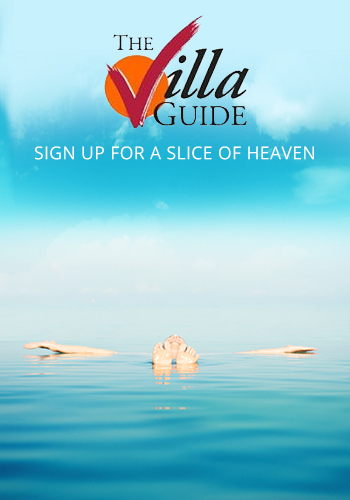 If it's paradise you're after, then look no further than Villa Shambala! Spectacular service, beautiful accommodation, delicious food, wonderful staff and in the heart of Seminyak. Every request was met with a smile and for a week of our lives we all felt incredibly spoilt. Thank you to all the staff at the villa who helped us to create very special and life long memories for our family, until next time. Best holiday ever. Fantastic food and service. Super friendly staff. We are going to miss this place but will be back in 2 years. Thanks for all the good time. Our stay at Villa Shambala was wonderful. The staff were all really attentive and respectful and helpful at all times. Arta, Ita, Dewa and Budi were especially friendly, kind and attentive. They all made our stay extremely relaxing and enjoyable. The food was also amazing and the style and comfort of the villa were great. Thank you so much for helping us have a wonderful holiday. We will certainly miss this place and the lovely staff here. We were amazed at the security of Villa Shambala. The villa is well planed out and perfect for large family. The attention to detail and style of the villa was impeccable. The staff were extremely friendly and accommodated all our needs. Magical pocket of Paradise. Our humble thank to most incredible staff that made our stay so perfect..... we wanted for nothing. Special thank to Jack, Arta, Widhi and Budi, you made our stay so special. Food was 5 star plus, thank you to the very talented Chef. Kelvin's birthday was made so special and decorated wonderfully by staff. Many many thanks. It's hard to describe how wonderful this place is. Thank you so much to wonderful staff - Jack, Arta, Widhi, Budi and the incredible Chefs. The food and service were out of this world. We have never felt so pampered our holiday. Highly recommended. The staff love working here and it was obvious in the dedication to give us the best holiday ever. Can't wait to come back to this very special place. Thank you to all the beautiful staff at Villa Shambala for making my birthday trip nothing short of amazing. You made all of us feel comfortable our whole trip. Your attention to detail did not go unnoticed, especially with all dietary requirements. We look forward to staying at Villa Shambala again. Could not recommend this villa more highly. Absolutely amazing time at Villa Shambala! Could not think of a better place to stay. All of the staff are so beautiful and welcoming. Every day here has been relaxing and fun! Special mention to Arta, Budy, Ketut, Arya, Widi and Jack who are put so much time and effort into making sure everything has been exactly the way we dreamed! I am sure Steph will never forget her twenty first birthday in Paradise! From banquets to cocktails every single part of Villa Shambala is a luxury retreat! Simply amazing, we will all definitely be back! Villa Shambala is a magnificent villa. It is a haven within the hustle and bustle of Seminyak. We had an amazing relaxing holiday and the staff were highly attentive and wonderfully friendly. All in all, it was fantastic, Thank you to everyone! We have has a wonderful relaxing stay at Villa Shambala, everything has been wonderful, the staff are so helpful and the food was beautiful. Gorgeous villa, yummy food and amazing staff. Beautiful villa, the staff are very friendly and helpful and would definitely stay again. Thank you a beautiful, relaxing holiday. Villa amenities were fabulous with house treatments on site. Staff were amazing, meals delicious with many a house cocktail to be had. Congratulation on maintaining a "Special" property that all of the quintessential elements of Bali - calm, talent and beauty. We have had an amazing time at Villa Shambala. The service has been top watch. Nothing was to much trouble, including organizing my husband's birthday. There was attention to detail at all times. This is a very tranquil oasis in Seminyak and well located for local excursions. We would highly recommend a stay here. If you want 5 stars service but space and calm. To all the staff, thank you so much for looking after us this week. We have had an amazing time and really appreciate all your help. The service, food and villa have been truly wonderful. A special thank you to Jack and Ayu for making everything run smoothly and always with a smile. Great villa, we missed nothing, very clean and well maintained by staff. Great food, Chef did a very good job. All staff very nice, kind and friendly. Thank you very much, we had a very great week. Thank you for looking after us so well this week. The food was delicious, the house is beautiful and the stay felt very relaxing and I loved every second. We have thoroughly enjoyed our 10 day stay with our extended family at Villa Shambala. A perfect holiday with kids and enough space for everyone to relax. Close enough to the shopping strip, restaurants and the beach. But with the amazing food prepared by our chef at the villa, we could happily stay all day relaxing. Thank to all the lovely staff for making our holiday so special. We would love to come back one day. Shambala is a beautiful retreat. The arrangement is very conducive to sharing happy time, eating, talking, swimming. Also everyone has a private place to retire for shares and sleeping. The integrates of outdoor and indoor is simply stunning from Buddha to swim pool. The varied menus cooked in the villa are excellent. We could gather for excellent barbecue instead of going to a restaurant. Most important is the kind staff who saw to an every need. No matter how small or difficult, every request for anything who fulfilled. Jack and Ayu were very special in helping with my husband. Thank you for making this per-wedding week so amazing. We also love the turtles and fish. A big thank you for an unforgettable stay at this very beautiful villa. You all help create a memorable Birthday for my wife Sila and the whole family. We will be back again. We have been to Bali many times before, but the experience staying at Villa Shambala could not be questioned. The staff, quality of the villa and meals were all 6 star. A very memorable experience, we will be back. Thank you. Wonderful experience, fantastic staff - very helpful, knowledgeable, kind and friendly. Your front of house staff Ayu and Jack are well trained in all aspects of villa hospitality - your food menu breakfast and dinner were excellent and the villa was spotless. I would recommend this villa to friends and family for a great experience. We have enjoyed a wonderful family holiday at Villa Shambala. Can't wait to come back. What an absolutely amazing vacation. We were expecting a great villa but it for exceeded our expectations. The villa was so relaxing, beautifully appointed but it was the fantastic staff who made our holiday perfect. Ayu, Jack, wheeze were so wonderful and made my 60th Birthday the best holiday we ever had. Would love to return again one day. Thank you so much. We spent a wonderful period here at your beautiful villa. Your staff were superb. The special efforts preparing the flower arrangements for my wife's 60th birthday and our daughters engagement celebrations will be a lifetime memory. To our two main butlers, Ayu and Jack, you were excellent - Thank you. The staff all did a wonderful job of ensuring all our needs were met. The accommodation, the facilities and attention to detail was excellent. Thank you all for making our time here at Villa Shambala truly memorable. 5 stars! Villa Shambala is one of the best places on Earth. The staff are the most beautiful people. The villa is the most beautiful villa. Stunning environment, followed up with the most helpful and beautiful staff. Nothing is to much trouble. I felt like a queen, everything was just perfect. 10/10 stay and will 100% be back in the future. Beautifully designed villa capturing the feeling of Bali, amazing. Very well kept garden and clean pool, Thank you Sugita and Rata. Our food from chef Ketut and assistant chef Komang - perfect variety, we ate everything. Gorgeous person. Arya, Jack, Widi and Budi, you looked after our every need - particularly the gin and tonic and Indah on the bike, wow! However the big prize for being wonderful goes to Ayu. This amazing women has a wonderful sense of what guests need. She works incredible hard and has individually made this holiday at Shambala wonderful. Congratulations Villa Shambala. What a villa! Thank you so much to the beautiful staff of villa Shambala. A holiday to remember forever. Perfect accommodation in every way. It is very hard to leave. I will be back. We had a wonderful family vacation. All of the staff were friendly and attentive. The house and garden was always kept beautiful and clean. The food and beverages were delicious, especially the barbecues. Everyone was managed so well and helpful, we never felt uncertain or confused about our trip. Thank you so much for looking after us and tolerating Evan's terrible music. One of the best villa's we have ever stayed at in Bali. The staff and service is exceptional. Always friendly, professional and willing to go beyond to make our stay here fabulous. Meals were amazing and rooms immaculate. I would highly recommend Villa Shambala to families or groups looking to have a safe and mess free holiday. Thank you to Ayu, Jack, Ketut and Widi for your excellent service and friendship. We are coming back for sure. We had a very nice time at Villa Shambala. Thank you for the delicious meals and warm hospitality. The villa itself was so restful and beautiful, and everything was excellent. Exceeded expectations, seamless service from breakfast to pool to massage to lunch and dinner. The chef did an amazing job, the cleaners kept the place immaculate the whole time. Jack and Ayu become like family to us all, and make sure we were all happy the whole time. We have enjoyed our time at villa Shambala immensely. The presentation of the rooms and gardens has exceeded our expectations (which were very high). The staff made us always feel very welcome, ensured that our needs were being met and made themselves available at all times. Nothing was to much trouble. we felt safe at all times and liked having security personnel at night. We appreciates the flexibility of dining at home or out and were happy with the menu selection and variety available. We enjoyed the convenience and ease of having massages and yoga within the villa. A big thank you to all staff. We would highly recommend this villa to others. Thank you. Thank you so much for the perfect awesome holiday. You have exceeded our expectations on every level. To Ayu - you have looked after our every wish to the maximum, restaurant recommendations and booking. Interesting insight into Bali life, thank you. To Ketut and Komang, - your food was awesome, the BBQ, Babi guling, wonderful breakfast and the amazing cooking class. Thank you. Also a big thanks to Jack, Widi, Susi, and anyone I forgot - you were all awesome. Thank you. We have had a great holiday. P.S. Thank you for making my 60th Birthday celebrations extra extra special. Loved my beautiful birthday crown and my flower birthday bed. Loved every moment. I have been to Bali 5 times and this villa is by far the best I have ever stayed at. The interior design is awesome. The staff is beyond fantastic. The sonos system is great so you can relax at the pool all day long while listening to your tunes. I would recommend this villa to friends or family. And next trip I will come back here. Thanks a lot. Good service and beautiful place. Very delicious food. I will come back. Villa Shambala is truly fabulous. Perfect for a luxurious and relaxing holiday. The staff are excellent and the food is a real treat. Love to visit again. Absolutely fantastic on all aspect. Wonderful, friendly and caring staff, who catered to our every need. The villa was equipped with everything we needed for a luxurious and relaxing holiday. Meals were delicious, we didn't need to eat out much. Thanks to all the Shambala staff. We hope to return. The whole staff gave excellent and prompt service, from the chef to Widhi and the security. The plants were so beautiful and well kept. Villa Shambala will be highly recommended to our friends and family in the Philippines. We had really a wonderful stay in Villa Shambala. Amazing location and the service. All my family, wife, children very much appreciated our stay at Villa Shambala. The house was very comfortable, the staff very friendly and helpful and the cooks prepared wonderful food. So, terima kasih banyak. Sampai jumpa lagi di Bali. Such an amazing stay. Wonderful, helpful staff and incredible chef. We didn't want to leave. Its so relaxing and the pool is the best and so close to fantastic shops and restaurants. We will be back. Thank you. Amazing time had by both families. Food and service first class. We all feel like we were treated like family. Dewa taught Georgi origami. The facilities were great. Loved the villa, beautiful, tranquil, wonderful rooms, and bathrooms. Staff were all amazing, with special thanks to fantastic Dewa, Ketut and Susi. We wish we could all stay longer, and we all want to come back and stay again. Sensational food made by Ketut. Excellent service! Location is ideal. Chef food is of good quality, we are enjoyed his cooking. The pool amenities were family friendly. Good service, patient employees, good food, pro chef, awesome place. We had an amazing time at Shambala. The villa itself is gorgeous, however, the staff made our stay so lovely. They are courteous and so warm and inviting, we will definitely be telling our friends and family about our lovely holiday. Thank you to all that have made our holiday so enjoyable. Fantastic staff, gorgeous villa, fabulous time. Thank you. Outstanding villa with a real traditional Balinese garden setting. Beautifully finished which comfortably accommodated our party of 9. Staff very helpful and friendly. Food was outstanding and we ate in both nights with traditional Indonesia fare provided by Chef "Ketut". No hesitation recommending to friends and family to visit and enjoy the experience. Great location with only 300m walk to beach, eat street & Kudeta. Look forward to next time. Villa Shambala has been like paradise on earth. It is a haven from the hectic streets of Seminyak. The staff are very attentive without being intrusive. They anticipate your needs and wants and are extremely efficient. Nothing is too much trouble and service is delivered with a smile. All the staff are warm and friendly and genuinely care. The facilities are fantastic and everything is beautifully maintained from the rooms, to the pool and the gardens. The pool is a perfect temperature and is refreshing without being cold. Make sure you have lots of in house beauty treatments as the recommended therapists the Shambala uses were incredible and always consistent. The meals prepared by Ketut were just divine especially the Indonesian cuisine. Everyday we were spoilt by amazing breakfasts which were the perfect start to the day. We are sad to be leaving Villa Shambala, our home away from home. Very refreshing stay for everyone of us. As the villa really care to both the young and old. Food was nice and staffs are friendly. Their constant chatting and communication is something they can be proud of. I hope someday my family will come back here for another stay. The house is very comfortable and we enjoyed the amenities which are high quality. The set up is perfect be mixed groups with families and couples. The staff was very helpful, always ensuring everything was perfect. The food with the Chef was great. We love Shambala and we will come back. I have traveled the world for 86 years and this has been the most wonderful 10 days where we have been treated as family. The location and environment is perfect and the staff have made our stay wonderful and unforgettable. I would never hesitate to return and most certainly would recommend Villa Shambala to all my friends in Australia and England. I wish management and staff best wishes from all my family and look forward to seeing you all again in the near future. An amazing, beautiful, tranquil place hidden behind the outside world. The food has been prepared with such love and enthusiasm, and presented the same way. To the staff at Villa Shambala, you have made our stay exactly how I dream my/our holiday would be. The beautiful smiles, happy faces and the way you embraced us with your kindness. Nothing was ever too hard. We especially found such peace here. I can't wait to tell everyone about our stay. I think the fish and turtles may have put a bit of weigh on from the many hands feeding them. Sad to say goodbye to dear Villa Shambala. Leaving with beautiful memories. So many thanks. Thank you to all the staff. We have had lots of yummy food & fun. Great pool. Outstanding visit. The villa offers the perfect holiday accommodation and the service from the staff was excellent. The food was very tasty and the swimming pool was used at least 5 times a day. A big thank you to all the staff. You made our stay extra special. We love Bali and we love Shambala. We had an excellent time in your lovely villa. The staff were incredible, attentive, helpful and professional. The facilities were excellently maintained, rooms very well appointed. And overall just a great experience. Thank you for being such lovely hosts and for making us feel at home. The Staff at Shambala is excellent. What a lovely group of people who care very much about service and make sure their guest are happy. We were very happy. Thank you Shambala. We had the most AMAZING experience here at Villa Shambala, I don't think we have ever experienced such tranquility and welcoming attitude from all the staff. The attention to detail was above and beyond. Thank you to all that are involved here, we had such a pleasant stay. We have been taken care off very well by the staff in this beautiful and magnificent villa. Your arrangements that you help us with was been very good. The food was the best quality. Thank you from all of us to all of you. Thank you so much to the wonderful staff at Villa Shambala, you made our holiday so amazing. Nothing was too much trouble. Our kids loved the milkshakes and the banana fritters. The dinners in the villa were the best we had in Bali. The villa itself is out of this world. Such Luxury. We can't wait to come back soon. Fantastic, helpful service. Susi, Dewa, Arya, Ketut and other staff were always available and willing to assist, making our stay very comfortable and enjoyable. Ketut prepared us a number of meals that were delicious. The villa is beautiful, spacious and well maintained. 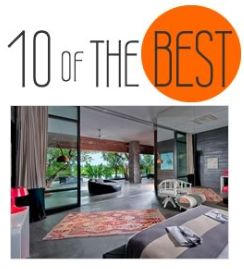 We would definitely recommend Villa Shambala to friends coming to Bali. Thank you for making our stay so wonderful! The villa is gorgeous and perfect for a group of friends or a family. We were able to thoroughly relax and unwind by the beautiful pool or in the lounge. The staff were magnificent friendly, helpful and ever present to care for our every whim. The food was delicious. Breakfast every morning and a highlight was the excellent BBQ on Sunday night. We will be back & will definitely recommend Villa Shambala to our friends in Hong Kong. Thank you again for everything. Great place, well maintained villa, perfect location, all the staff were so good and helpful. The pool is great and the rooms is nicely decorated. This is a magnificent villa complimented very very well by an excellent staff who were always available when we needed them. Amazing villa, lovely, friendly, attentive staff. Thank you for helping us have a wonderful relaxing break from our busy lives. It will be hard to return to real life with no fairies to look after us. Superb staff, very nice villa. We spent 7 days in Shambala Villa in Seminyak and I can say the stay was wonderful. Perfect service provided by Arya and Susi, tasty and nice food prepared by Ketut. The Villa is very well equipped, big pool, nice rooms, but the best was the very convenient living room. Really nice stay in Shambala. I think we will return again. Our stay has been fantastic. Everything is clean in villa. Food service was great. Staff was very attentive. Arya is a great Manager and great friend. Staff was very friendly. Had a wonderful time. Thank you for an incredible stay in this beautiful villa. It is truly spectacular place physically but the experience is even more special because of the attentive and friendly staff who go out of their way to make you feel at home. They truly treat you like family. The meals were restaurant worthy and we are so sad to leave this beautiful place. Thank you to every staff member that made our stay memorable. We hope to come back soon. What can you say about 2 weeks in paradise, terrific villa, fabulous weather and a staff that exceeds any 5 star hotel? How about "Absolutely Brilliant"! Amazing!! Thank you chef, staff and everyone else. Love it! Love it! Love it! Thanks for having us Villa Shambala. Such a picture perfect place. The staff were lovely and the food was delicious. Had the best time. Cannot wait to come back. One of the most equipped villa with all the convenience and comfort. The highlight of the stay was the hospitality. The staff is super alert and active. They are extremely efficient and take extreme care from food to hygiene. Over all our stay was a memorable one. Thank you. Our expectations were exceeded in every way. We will recommend Villa Shambala and plan to return when possible. Great location, close enough to all the action but still very private, secluded and peaceful. The staff were very warm, friendly and nothing was too much. The quality of the food and drinks was great and to a very high standard. The design of the villa suited us and made the holiday very easy and relaxing even with three different families needs. Thank you so much! That was awesome. Lovely Villa, Extremely well done up and well kept. The staff is very professional and the Chef is exceptional. We enjoyed our stay. What a beautifully presented Villa. It was just perfect for what we were looking for. Great pool, accommodation, lot of space. Thank you to the lovely staff for all the assistance and hospitality and to the Chef for his good food. We are sure to be back sometime soon. Thanks. Short but really nice stay at Shambala. The villa is really well maintained and clean. Thanks for the great lunch and the excellent dinner. It was really a pleasure to stay in this property where we can feel the Bali atmosphere. This Villa was amazing with very friendly staff. Wow. Good service, nice place. What a Divine week. We have been fed with beautiful Balinese food, drink and been pampered and looked after so well by the great staff at Villa Shambala. It has been an unforgettable stay in a secluded tropical haven. Lovely food and Balinese smiles have made our week. Not to mention massages and scooter rides. My sixth visit to Bali and the best visit ever. Thank so much. We can't wait to come back. We stayed here with our friends and had such a fantastic time. We loved the fact that there was so much space, so parents & young adults alike could all spread out. We found the staff to be very friendly, helpful and efficient. Nothing was too much trouble. I will miss lazy time in and around the pool. Thank you to everyone for making our holiday so awesome! Beautiful Property, well layout and absolutely amazing staff. Great Service and very helpful. Thank you to all the staff at Shambala. Every person worked hard to ensure all of the guest were catered for. Great breakfasts, canapes and dinners. Beautiful property, beautiful kind Yoga teacher. Excellent massage therapist. We all loved our stay. Gorgeous bedrooms and wonderful flowers. My family and I had the best vacation ever at Villa Shambala. We loved and thoroughly enjoyed everything that was offered. Very tasty and fresh food (Thank you so much for the home made oatmeal cookies), Perfectly decorated bedrooms, welcoming and clear swimming pool, videos in the home theater. Everything was great. Most at all, all Villa Shambala staff are so nice, genuine and caring to our every needs. We are so sad to leave but feel blessed to have spent our wonderful holidays in this magical place. We hope we can be back soon. This is a perfect place for a perfect holidays. Thanks again. Thank you so much to the amazing, kind and caring staff at Villa Shambala. We have all had the most amazing, relaxing time at this most stunning Villa. All the staff have gone above and beyond and anticipated every need with a big smile. Villa Shambala was an amazing villa to stay at. From the beginning of the trip upon our late night arrival, staff met us with food and drinks and explained the villa to us. The staff was always willing to help in anyway possible. Food was prepared when and how we requested. The staff was more than willing to arrange taxis for our group and reservations at local restaurants. I was extremely impressed with the house and would definitely recommend it for anyone staying in Seminyak. We loved Villa Shambala! Staff were amazing, we were so sad to leave . Will definitely stay again. The Villa is exactly as shown on the website - if not better. There is somewhere to "get away" for everyone. We were an extended family ( from 70 to 2) and the separate bedrooms worked very well. The outdoor eating area made for many happy family meals. The pool was large with a shallow end for younger children and deep enough and large enough for a decent swim. The staff were outstanding. There was always someone there for meals and the chef did a wonderful job of cooking for the children as well as the adults. Butlers, room attendants, gardeners were all helpful and nothing was too much trouble. A wonderful week. We had to drag ourselves away. The villa is absolutely amazing just like heaven. The property location is incredibly private, but walking distance to the beach and Seminyak restaurants and shops. The service was excellent and the staff is just amazing. Thank you for everything! We miss you and can't wait to go back. Best Villa I've ever stayed in. No need to leave. Oh My!! we can't rave enough about this place - although I want to keep a lid on it due to the fact that we don't want it to become too popular we can't get back in!!! We help my 40th poolside soire here and could not have asked for a better time! the staff could not do enough - the food impeccable - the atmosphere fun and fabulous when we needed it and relaxing and indulgent when things needed to be slow! our guests and ourselves were truly blown away with Wayan, Arya and his team!! well done to a fabulous bunch and a true gem of a villa! We had a fabulous time and would love to come again!! It is a stunning villa, in a great location with excellent staff. Highly recommended. Stunning Villa in the earth of Seminyak, only few steps away from the beach and KUDETA's spotlights. Despite the central location, we enjoyed peaceful time only surrounded by palms and bamboos trees. Bedrooms are spacious, charming and really well decorated, only one of the five bedrooms does not meet the same standards and it's more suitable for children or temporary guests rather than for a couple taying long term. 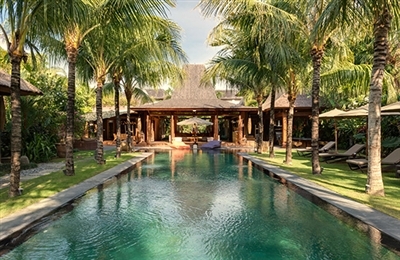 The outside area is dominated by one of the biggest pools you can find in a private villa in Seminyak. And for better enjoying this slice of paradise we have been supported by a kind, unobtrusive and smiling staff. For sure it was one experience we all would like to repeat in the near future! based on 93 user reviews. A beautiful villa that sleeps ten plus, and is right in the heart of Seminyak? Sign us up! Villa Shambala will definitely be a popular choice amongst the cognoscenti with large families or groups of party people who simply dig the happening atmosphere of Seminyak. The design, with two bedrooms and a TV room in the main building and three bedrooms and another TV room in the guest house, is a great layout for bringing the in-laws or giving the teenagers (and yourselves) some space. The staff are friendly and very efficient, and the cook can turn his hand to anything. Make sure you grab yourself a massage or an Ayurvedic treatment in the specially-built spa room adjacent to the pool. The owner is an artist and jewellery designer; some of her unique creations can be seen in the villa and are available for guests to purchase.